Surging Seepage was the beginning of a whole new way of working and thinking for me. Before Surging Seepage, I was primarily sculpting the human figure, and it was when I started to break down the figure - deconstructing the body, and thinking of the body as a system - that things really opened up for me in the studio. 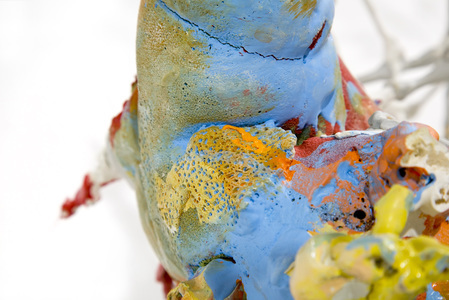 My practice shifted into abstraction and I went into a frenzy of experimental making. From there, I started relating the systems of the body to other systems of growth in the natural world and I began to think more broadly about biological materials responding, relating, and reacting to one another. I also began working with bright colors and became interested in blurring boundaries between the real and the imagined. 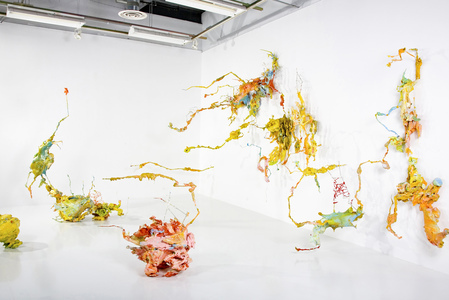 The work evolved through a series of installations that morphed and changed with each iteration and installation itself emerged as a way for me to explore growth, movement, and expansion. I developed this series from 2008 to 2009.